Lettered UR, in a tablet: "IO AN.BX" and alond the right margin: "DIVO HERCVLI INVICTO"
Levenson, Jay A. et al. 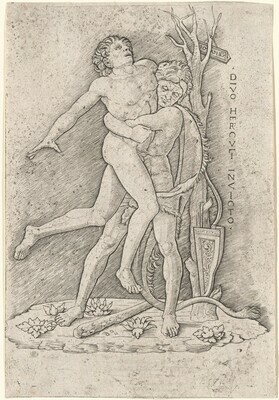 Early Italian Engravings from the National Gallery of Art . Washington, 1973, no.88. Boorsch, Suzanne, et al. Andrea Mantegna. London and Milan, 1992, no. 87, state ii/ii.